rmeister was awarded the Basic Barnstar by warren for their work in this research note. Before explaining the decoder itself I will recapitulate some technical fundamentals. The SoftModem library modulates data into signals with Frequency Shift Keying in the audible range. To be more exact, SoftModem uses BFSK (binary FSK, also sometimes called 2FSK) that is working with two frequencies. A binary 0 is mapped to the lower frequency and a binary 1 to the higher frequency. In the following picture we can see a recorded signal with its two frequencies. Clearly, it is hard to detect bits correctly in this signal. For a sequence of identical bits the amplitude drops until a different bit follows. In the case of a (long) preamble the signal would fall very close to zero, making it impossible to detect its presence after a while. Done for both frequencies, we obtain two signals containing the information how strong the frequency in question is present in the original signal. Finally, the difference of the correlation signals is the demodulated signal. In the following picture we see (in this order) the recorded signal, the correlation with the lower frequency, the correlation with the higher frequency and the resulting demodulated signal. One thing to note is the window length for the correlation process. Using a window leads to an averaged signal. Ideally the length fits to the number of samples per bit. If the length is to large, the influence from the previous and next bits will increase, which makes the resulting waveform blurred. In contrast to the demodulated signal above, the picture below shows a result with adjusted window length. Now the signal is ready for decoding. To understand the decoding process, let's first explain how data is encoded by SoftModem. This is similar to usual serial communication (e.g. UART). There are two main differences: befor sending the Start bit a preamble is prepended and the end of a transmission is denoted by a Push bit. Omitting the Push bit means more data will follow. Now let's see how we can decode the demodulated signal. The decoder is build as a finite state machine with the states PREAMBLE, START, DATA, STOP. Initially it is in the state PREAMBLE. In this state the decoder trys to find the preamble by counting the samples that are larger than a certain threshold. If a preamble was detected, the decoder jumps to the middle of the Start bit and goes into the START state. There the decoder evaluates if the Start bit is set or if it jumped into the START state by mistake. In case the Start bit is set, the decoder jumps ahead for the number of samples per bit. Now the decoder position should be in the middle of the first Data bit and in state DATA. In this position it evaluates the first Data bit and consecutively the following 7 bits. Afterwards, the decoder goes into the state STOP and checks if the Stop bit was set correctly. Following, the decoder checks the Push bit. If the Push bit is set, transmission is over and we go to the PREAMBLE state. Else the next state is DATA, as a missing Push bit is the equivalent of a Start bit and indicates that the sender will continue transmitting data. In the next picture we see the positions (red lines), where the demodulated signal will evaluated by the decoder. There is one issue with this proceeding: synchronization. Given that the transmitter sends faster (or slower) than the decoder expects, there will be an offset and the decoder may check bits at a wrong position. This problem occurs due to rounding errors in SoftModem. I calculated the relative error for the duration of a single bit for the default parameter sets of SoftModem. Regarding the error, the baudrate is negligible and the error rather depends on the used frequencies. To generate an alternating signal, SoftModem makes use of timers. After the timer hits a certain count, the signal will be flipped. When calculating the this count, a rounding error is induced. 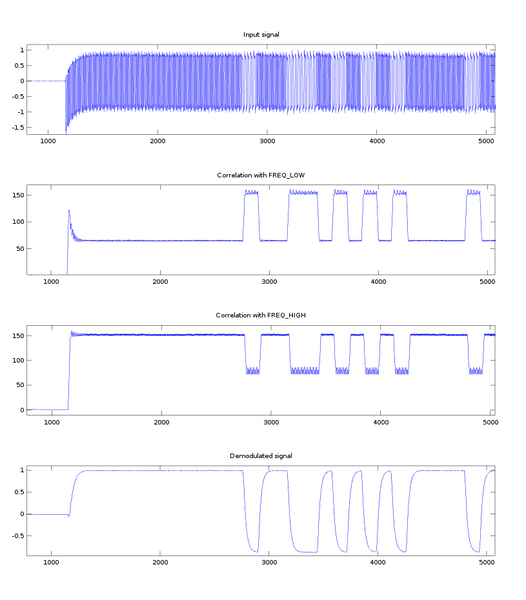 Another error may be induced by the choice of the sampling rate of the decoder. E.g. at the (common) sampling rate of 44,1kHz and a signal frequency of 1575Hz, one period will be exactly 28 samples. But if we choose a sampling rate of 29,4kHz (and the same signal frequency), one period would be aprox. 18.7 samples. Furthermore I came across another problem regarding the detection of the preamble. In SoftModem the length of the preamble is variable, increasing with the time since the last transmission (until a maximum that depends on the baud rate). This is not necessarily bad, but the minimum preamble length may also be smaller than a sequence of 8 consecutive 1's. In case one transmission ended (with a push bit) and a new transmission starts immediately, the preamble is short and may not be detected. Other encoding schemes solve such issues with bit stuffing. In this case, I'd like to propose changing SoftModem to use a fixed length preamble. I did this Help out by offering feedback! Browse other activities for "webjack"
This is a fantastic and very clear explanation. Thanks so much for all the work and thought that went into this! In the end, did you decide to modify Softmodem to use a fixed-length preamble, as per the discussion in the last paragraph? Update: actually, nevermind :) I've read more about error detection codes, and I'm learning that there might be better / easier ways of implementing error detection that won't require messing with SoftModem or the main Webjack code. Will post further updates as I learn more ... but meanwhile, don't waste your brain energy on my previous proposal, as it doesn't seem like the best way to go (at least, from my perspective now). Cheers! I think forward error correction could be done on top of webjacks encoder and decoder, without dipping into the encoder and decoder themselves, no? Like, make a new library that uses webjack, and just for-loops to send each thing three times? But has the same API as webjack, like send, etc. That might be architecturally much simpler. The new library could be included with webjack, and/or chained into the pipeline between webjacks public API and the encoder/decoder. Then you'd have to write the same thing as an Arduino library, or an extension to the modded soft modem lib -- perhaps with a similar abstraction to the webjack implementation. So if error detection is set to on, it pipes it through the error correction module before sending it to the encoder. Yes, exactly! That's what I finally came around to this morning :) That's the proper level of abstraction here; there are various clever schemes for detecting errors, and they can all be tried out on top of the system as it stands, just as you suggest. Yeah and I'm also happy to add a callback function for any error correction module specified in the webjack options. Hi Don, thanks for your awesome feedback! That notebook looks really cool. I wasn't aware of Jupyter and it looks like a great way to explain and visualize things. I did not change SoftModem regarding the variable preamble. The current solution is to accept only preambles with a length of exactly 1 bit OR greater than 12 bits. This means that the preamble lengths 2-11 (times the length of one bit) can not be detected correctly. I've experimented with a probabilistic approach to come around this and detect all possible preamble lengths SoftModem will generate, but it did not work out well. Regarding errors: if you want error correction, I think Hamming is a feasible choice. As you already pointed out, doing this as a layer on top of the SoftModem transmission scheme is a good idea. I see on github that you already did some CRC stuff, very cool!